Some people love winter while others can't wait for the warm air of spring to make its triumphant return. For the latter, cabin fever can become a problem as winter progresses. Cabin fever is the feeling people get when they are relegated to spending long periods of time indoors. Because winter weather can be harsh, cabin fever most often occurs in the winter, when the weather outside discourages people from spending time outdoors or opening their windows to let fresh air in. Though there's nothing men and women can do about the weather, they can take steps to quell cabin fever and avoid the wintertime blues. There are plenty of ways to make a cabin less conducive to cabin fever. * Let the sunshine in. Cold air outside makes it foolish and potentially unhealthy to open the windows. But homeowners can still let the sunshine outside those windows in. Pull the curtains back and open the blinds to let as much light as possible into a home throughout the winter months. * Work by the window. More and more people now telecommute to work, which can make them more susceptible to cabin fever during the winter months. Choose an airy room with lots of windows to house your home office. You'll want your desk to face the windows during the workday so you can benefit from the midday sun. * Improve your home's aroma. While the validity of aromatherapy remains open for debate, improving a home's aroma during the winter months can remove the musty smell that forms when a home has been poorly ventilated for weeks or even months. Supporters of aromatherapy suggest that some essential oils, including lavender and peppermint, improve one's mood. Many people feel winter is a time to hibernate, which can make them more susceptible to cabin fever. But even when the weather outside isn't conducive to a backyard pool party, men and women can still stay active to fend off cabin fever. * Exercise regularly. Regular exercise has both physical and mental benefits, the latter of which can be especially valuable to those hoping to quell cabin fever. Exercise releases certain neurotransmitters in the brain that alleviate pain and improve mood. Regular exercise during the winter months can reduce the risk of developing cabin fever while making the months more enjoyable as well. * Get outdoors. 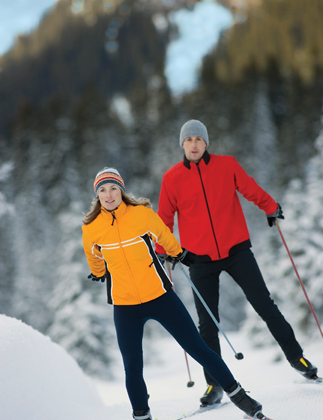 Men and women don't have to spend hours in a gym each day to stay active during the winter months. It's still possible to spend ample time outdoors when the weather is cold. Walk or run when the conditions allow or embrace an activity such as skiing or snowboarding to get off the couch and spend some quality time outside. * Shovel the driveway. If your body allows, shovel your own driveway when it snows. When done correctly, shoveling is great exercise, and you may even cherish the time you get to spend outdoors. If cabin fever is proving especially problematic, you might be suffering from a condition known as seasonal affective disorder, or SAD. SAD is a mood disorder that occurs at the same time every year, most often in the winter, and may be a result of reduced serotonin production related to decreased exposure to sunlight. Also known as seasonal depression, SAD can mimic depression, and men and women who suspect they might be suffering from SAD should consult a physician.